Are you old enough to remember a time when the German Shepherd Dog (GSD or GSDs) were called "Police Dogs" by most people throughout the USA? Why was that? 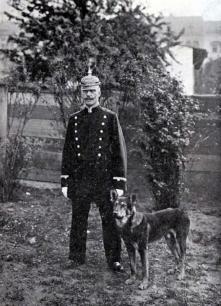 The GSD was more popular as a working dog, mostly used for Police and Military work than kept as a pet at the time. Dogs used for Police and Military Work go through many tests, health, temperament, and working abilities, before they start vigorous training. Some dogs are used for specific purposes, such as Bomb Detecting and Drug Searches. 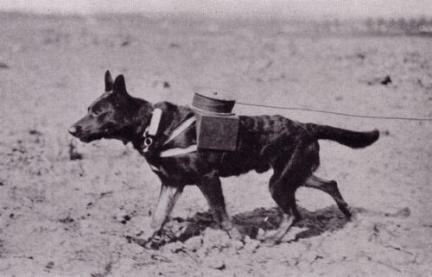 Many GSD "breeders" and or uninformed people will tell you that the GSD was the first War Dog...not true. 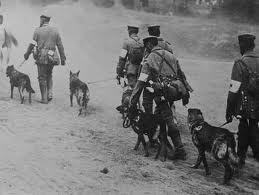 Big dogs have been going "off to war" as long as men have owned dogs and gone to war. The Roman Soldiers as well as many other past armies had Mastiff Dogs that were found beside them on the ground. You will not see many, if any, White GSD used for Police or Military work. It is not that the White GSD could not do the work, or pass the tests for the work. The problem is that the white shedded hair looks unsightly on the Uniforms that they work so hard to look crisp and clean and correct. A Dog that will become a Police or Military Service Dog will need to be well trained, not just in Search and Rescue as we think of Search and Rescue, but also bomb sniffing as well as Tracking. 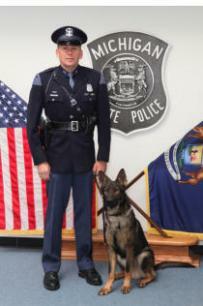 This dog will have to be on it's toes with it's Schutzhund Training. Above all the dog needs to have the correct Temperament. Puppies must be temperament tested and approved before the long hours of training ever begin. This is why Police and Military Dogs are chosen from puppies from Working Kennels out of dogs that ARE or have been Working Dogs. The photo of the dog to the left is one that they are using at the 2014 Winter Olympics in Russia. PLEASE NOTE THAT IN OUR DOGS PEDIGREES THERE ARE MANY WORKING DOGS WITH JOBS NOT ONLY WITH THE POLICE AND MILITARY BUT ALSO BORDER GUARD DOGS. You can find the abbreviations on our page for that and find them in their pedigrees. There are not just a few of these dogs in our dogs pedigrees! The contents of this page for Police & Military is still under construction. Please check back later!